Flowers that Attract Hummingbirds. Our Personal Recommendations. 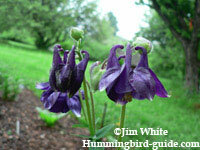 Flowers that attract hummingbirds can be the blooms of shrubs, perennials, trees and annuals. Find some of our favorite flowers that attract hummingbirds below. Was your first hummingbird visit unexpected? When we moved to Vermont our property had several flowers in an overgrown garden. That first summer, we began to notice a few of these tiny helicopter type birds making daily visits to some specific flowers and our newly hung flower baskets. These birds were beautiful and we wished for more of them. At that time, we didn't have any idea how to turn what seemed like a coincidence into a cooperative effort on our part to attract them. Would you like to intentionally increase the number of hummingbird visits to your garden, deck, or patio? Over the years, we've learned that one simple way of enticing these birds was to increase the number of flowers planted or displayed. What are the Best Flowers that Attract Hummingbirds? You may notice these little glittering birds are frequenting your brightly colored flowers with particular shapes. We've put together a list of a few of our favorite flowers that attract hummingbirds below. They are also very smart and know which flowers are best for them. Red, orange, pink and purple blooms are favored. Like bees, they can also assess the amount of nectar in flowers. They will accept a nectar reserve of 15% but prefer 25% to meet the demands of an exceptionally high metabolism. 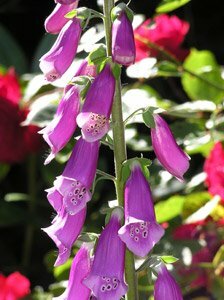 Our friendly visitors are enticed by the trumpet shaped flowers and blooms that hang downward, such as the lovely foxglove. Hummingbird flowers are usually red, orange, pink and purple, often trumpet shaped, sometimes hanging downward. These blooms add beauty to your garden, deck, or patio while attracting these awe inspiring little birds......the hummingbirds! Some examples of flowers that will attract hummingbirds are Salvia, Morning Glory, Phlox, Columbine, Bee Balm, Bird of Paradise, Lillies, Trumpet Vine, Cypress Vine, Honeysuckle and many more. Visit our page on creating a Hummingbird Garden where you will find advice and links to specific flowers for each planting zones in North America. We've teamed up with "Direct Gardening" to offer some of our favorite flowers that attract hummingbirds at great prices. To make your choices easier, we have a page on what flowers that attract hummingbirds will thrive in the different planting zones. Attract charming hummingbirds to your yard with these seven vividly-colored favorites. 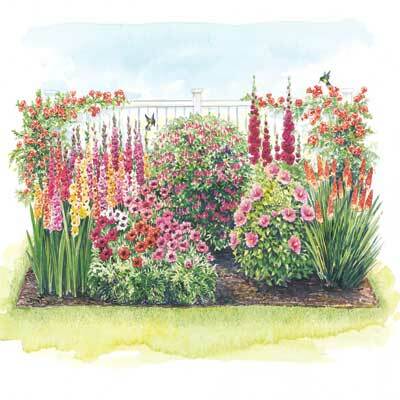 Buy our money-saving Hummingbird Garden Collection designed to fit a space 10' wide x 8' deep and save over $6.00 from the regular price. Plus we include a FREE planting diagram to match the illustration shown. A columbine unlike any other! The Dorothy Rose Columbine has lovely, luminescent, light rose-pink flowers that make this an excellent specimen plant. Blooms are quite distinctive as each one has several blooms set inside one another. The Dorothy Rose Columbine also has very attractive light green foliage. Attracts butterflies and hummingbirds! Blooms late spring to early summer. Deer resistant, great cut flower, for a rain garden. 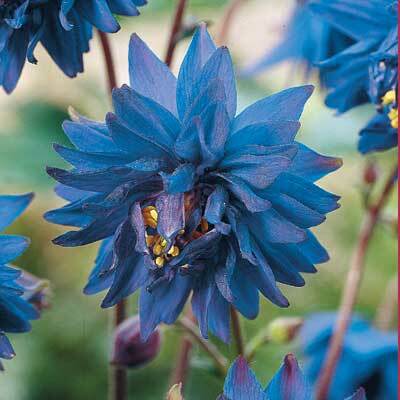 Fully double flowers make the Barlow Blue one of our favorite columbine varieties! Wonderful plants perform best when planted in partially shaded areas. Rabbit resistant. Blooms late spring to early summer. Attracts butterflies and hummingbirds. Can be used as cut flower. For a rain garden. 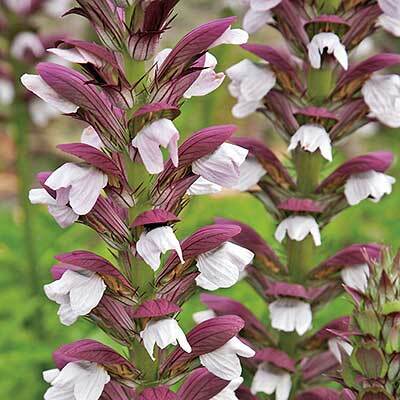 Named for it's lobed foliage that has soft spines on it, Bear's Breeches is prized for it's striking maroon and white flowers on upright 36-48'' stems in early to mid-summer. The plants spread 30-36'' across and grow best in partially shaded areas of the garden. They make excellent companions for hostas. Attractive to hummingbirds and deer resistant. 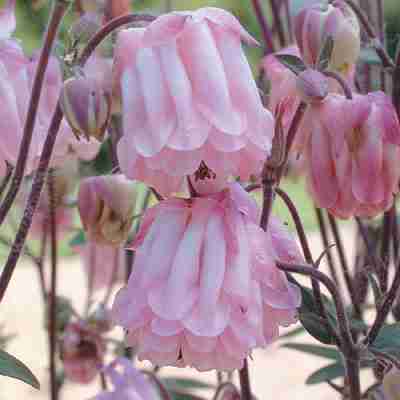 This plant is an improved variety over the old-fashioned bleeding heart. 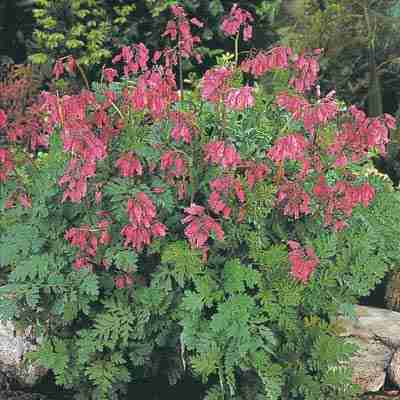 Beautiful as the old-fashioned variety is, the Fern-Leafed Bleeding Heart blooms for only a short time in the spring, whereas this fringed, or Fern-Leaf Variety blooms from mid-spring to late fall, with its beautiful rose-pink blooms by the hundreds on 10-18'' stems. Grows best in light shade, but will tolerate full sun if the soil is moist. Plant about 12-18 inches apart. Get all-summer bloom in one area that might otherwise require a number of different plants to get such results in partial shade. Number one field grown plants. Attracts hummingbirds. Deer resistant. Can be used as cut flower. One of our favorite new perennials, the deep blue flowers of Blue Butterfly Delphinium begins in summer a reappear all season. This rare dwarf delphinium grows just 12-14'' tall -- ideal as a colorful low hedge or the front of a border. 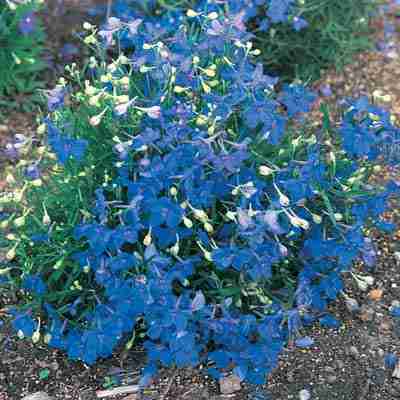 The Blue Butterfly Delphinium needs no staking and is said to be deer resistant. Just think of the beautiful bouquets these blooms will make. Blooms best in full to part sun. Field grown plants. Rabbit and deer resistant. Attracts butterflies and hummingbirds. Great cut flower. For a rain garden. The Adam’s Needle Yucca is a handsome plant with sharp, evergreen leaves. It is one of the easiest perennials to grow and will thrive almost anyplace and is carefree when established. It also never misses a year of showing off its ivory bells on 4-6' spikes. 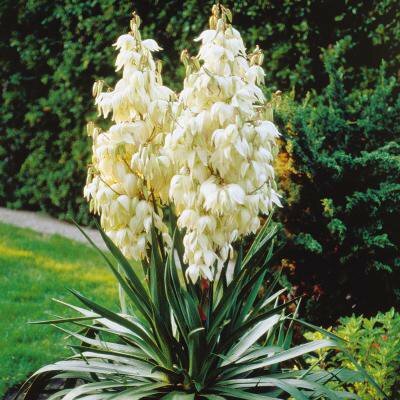 Plant a cluster of three Adam’s Needle Yucca for that exotic touch at your home. Blooms: late summer. 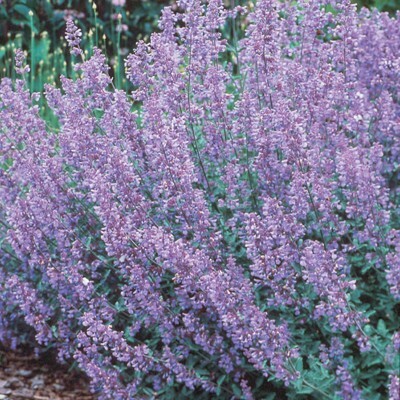 Deer and drought resistant, attracts butterflies and hummingbirds. Salt tolerant. Evergreen. Bloom at intervals all summer - even on into fall! Hardy, healthy plants bloom in a rainbow of colors even during the hottest, driest summers. Have a wonderfully spicy fragrance. Grow 15-20'' tall. Mixed colors. Blooms: summer to fall. Drought and deer resistant, attracts butterflies and hummingbirds, great cut flower, fragrant. Native of South Africa. Hardier than most spring planted bulbs. Grow 24-26'' tall. Bloom July-August. Performs best when planted in full sun and well drained soil. Mixed colors. Attracts butterflies and hummingbirds, deer resistant, good for cutting. 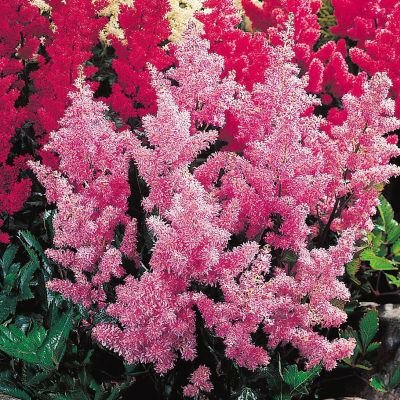 Astilbe has been loved for years for its feather flower spikes. Sometimes called Goatsbeard or False Spirea. Astilbe blooms from June through August and can be used in dried flower arrangements. Deep green foliage with tones of bronze is deeply cut and very graceful. Beautiful, easy to grow perennial that is very hardy and free of plant pests. Plant in a deep moist soil, rich in organic matter in partial shade. Can be grown in full sun if extra moisture is provided. 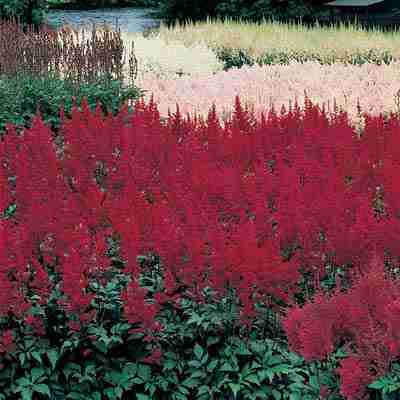 Red Astilbe is an elegant introduction with the brightest red flowers of any Astilbe. Grows 2 feet tall, forming a mound 18 inches wide. Brilliant spikes, over 12 inches long, blossom over a long period. Attracts hummingbirds. Deer resistant. Can be used in rain gardens and cut arrangements. 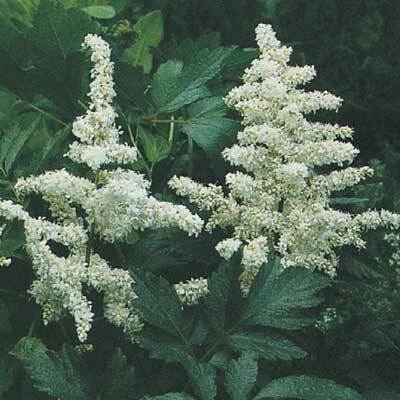 The White Astilbe has very early blooming of white that grows about 24 inches tall. Dense, compact clusters of snow-white flowers seem to glow with a light of their own in those shady garden spots. Attracts hummingbirds. Deer resistant. Can be used in rain gardens and cut arrangements. 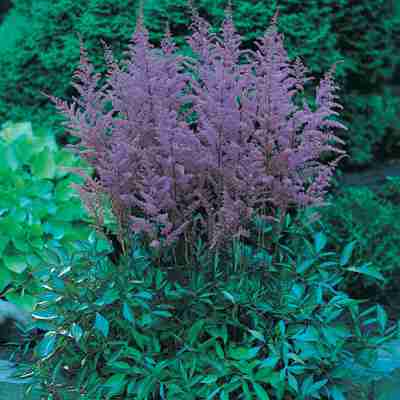 Lavender Astilbe has been loved for years for its feather flower spikes. Sometimes called Goatsbeard or False Spirea. Lavender Astilbe blooms from June through August and can be used in dried flower arrangements. Deep green foliage with tones of bronze is deeply cut and very graceful. Beautiful, easy to grow perennial that is very hardy and free of plant pests. It needs to be planted in a deep moist soil, rich in organic matter in partial shade. Can be grown in full sun if extra moisture is provided. Each and every summer, feathery 24'' lavender spikes appear. Mounded plants have fernlike foliage that grows up to 18'' high by 24'' wide. Attracts hummingbirds. Deer resistant. Can be used in rain gardens and cut arrangements. The Pink Astilbe is the finest true pink. Very densely packed florets on plants about 18 inches tall. Very graceful, yet eye-catching plants. Foliage is a rich, clear, glossy green. Attracts hummingbirds. Deer resistant. Can be used in rain gardens and cut arrangements. Flaming color! Our Hardy Azaleas are brilliant flowering shrubs that bloom in magnificent profusion. Azaleas so hardy they thrive where winter temperatures drop below zero. 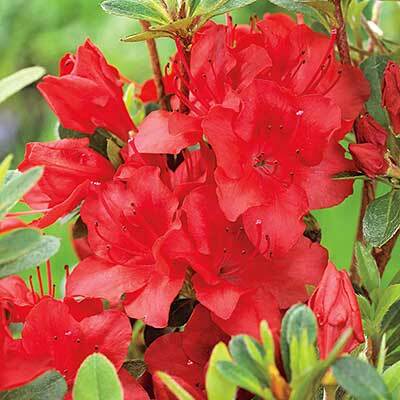 Hardy Azaleas far superior to old-fashioned varieties. Lovely flowers cover these plants as few others can do. Make ideal foundation plants. And, you can start enjoying their colorful blooms this coming spring. Attracts butterflies and hummingbirds, fragrant. Flaming color! 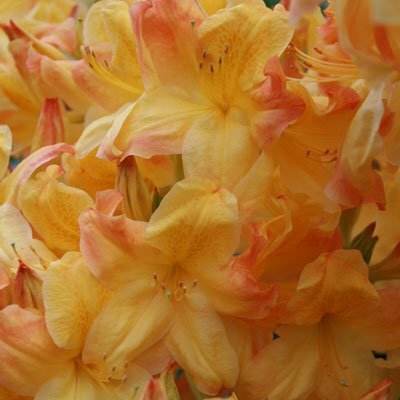 Our Hardy Azaleas are brilliant flowering shrubs that bloom in magnificent profusion. Azaleas are so hardy they thrive where winter temperatures drop below zero. 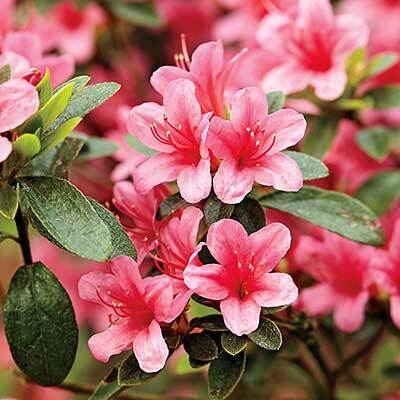 Hardy Azaleas are far superior to old-fashioned varieties. Lovely flowers cover these plants as few others can do. Make ideal foundation plants. And, you can start enjoying their colorful blooms this coming spring. Attracts butterflies and hummingbirds, fragrant. Flaming color! 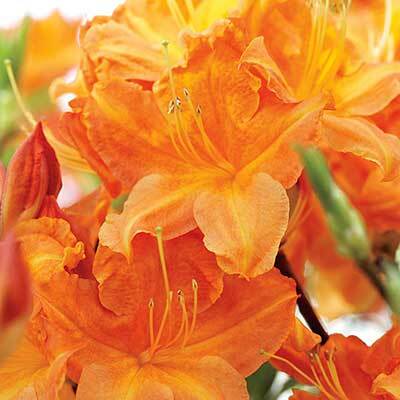 Owen's Hardy Azaleas are brilliant flowering shrubs that bloom in magnificent profusion. 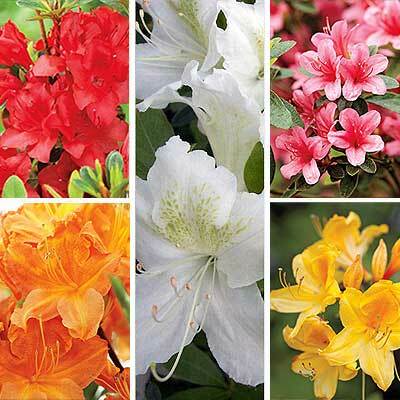 Azaleas so hardy they thrive where winter temperatures drop below zero. 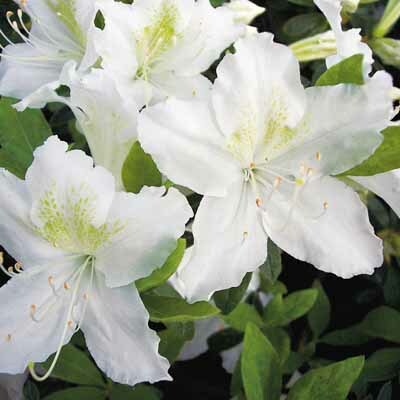 Hardy Azaleas far superior to old-fashioned varieties. Lovely flowers cover these plants as few others can do. Make ideal foundation plants. And, you can start enjoying their colorful blooms this coming spring. Attracts butterflies and hummingbirds, fragrant. Tall, elegant, Hybrid Lilies are hardy, easy to grow and become bigger and more beautiful every year. Scatter bulbs where you want a dazzling spot of beauty in an informal setting. Especially practical along foundations and hard-to-mow places. These Hybrid lilies flourish even in wooded areas. 10-12 cm bulbs. Bloom mid-late summer. Good for cutting. Plant 6-8'' deep and apart in full to partial sun. Attracts hummingbirds. Wonderful as a cut flower. Order now for fantastic color! We send our choice of color. What a dramatic coloring! 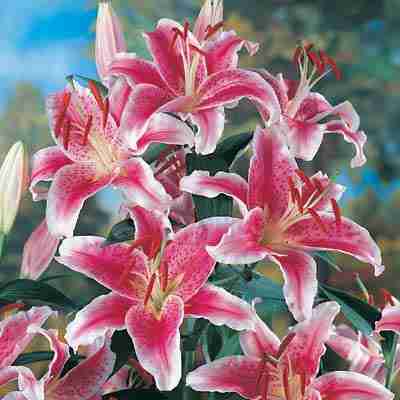 Hardy Stargazer Lilies have brilliant red, freckled blooms that mellow to a soft pink with snowy white edges. This handsome, upward facing Oriental Lily is ideal for growing in gardens, patio pots, along foundations, walks or driveways. 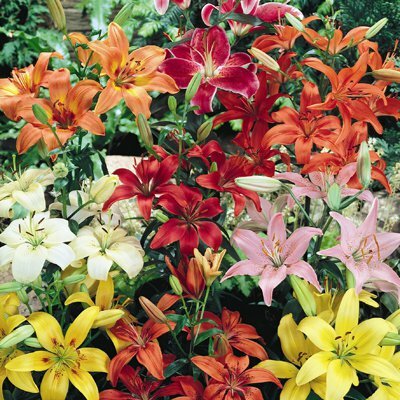 The Stargazer Lily has a fresh, pleasant fragrance and makes long-lasting cut-flower bouquets. Provides a profusion of flowers in June and July. 10-12 cm bulbs. Attracts hummingbirds, good for cutting. Plant 6'' deep. Silver Medal Winner! 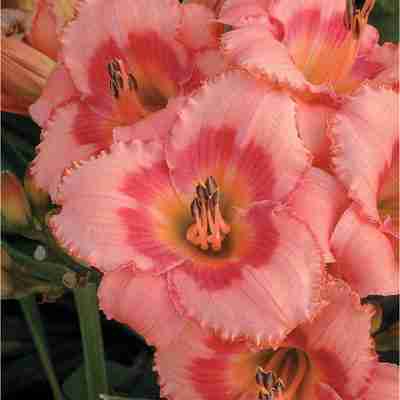 Strawberry Candy Daylilies feature magnificent 4 1/2'' strawberry pink blooms that surround distinctive rose-red pink eyes and golden green throats. 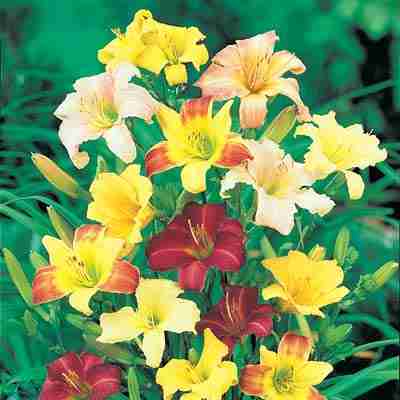 This is rapidly becoming one of the most popular new daylilies on the market. Excellent re-blooming variety. Grows to 26''. Field grown plants. Blooms: June to July, Drought resistant. Attracts butterflies and hummingbirds. Fragrant. A splendid, ''hands-off'' cover for steep slopes, banks and other hard-to-mow areas. The Ground Cover Daylily flourishes even in wooded areas and near streams. Plant along roadways, walks, drives and fences. 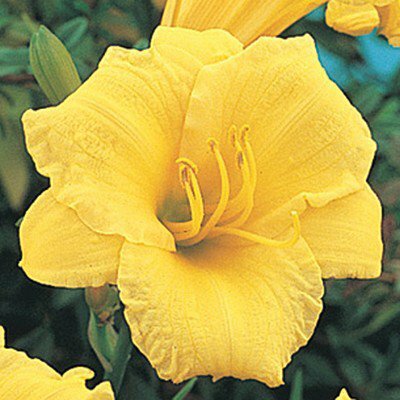 One Ground Cover Daylily will produce 50 or more charming 4-5'' blooms a season. The foliage is attractive and grows to about 2' tall. Deer resistant. Drought tolerant. Attracts hummingbirds and butterflies. Mixed colors. A cut flower favorite! No other flower offers so much color and beauty for the money. 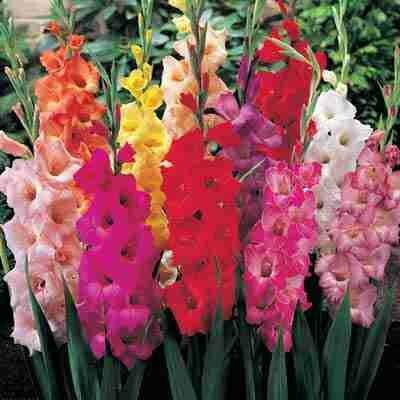 These Glory Glads are easy to grow and bloom in mid-summer to fall. They make striking, long-lasting bouquets. This is our finest assortment of dazzling colors. We send strong, healthy, blooming-size bulbs that will give you beautiful flowers this year. Send now while this money-saving offer lasts. We expect a fast sellout! Attracts butterflies and hummingbirds, deer resistant. Bulbs are hardy in zones 8-10 and need to be lifted for the winter in colder climates. A Royal Horticultural Society prize winner! Here is a beauty you can't afford to miss. If you enjoyed the old-fashioned single Hollyhocks in Grandma's garden (and who didn't) you'll really fall in love with these tall, majestic beauties. 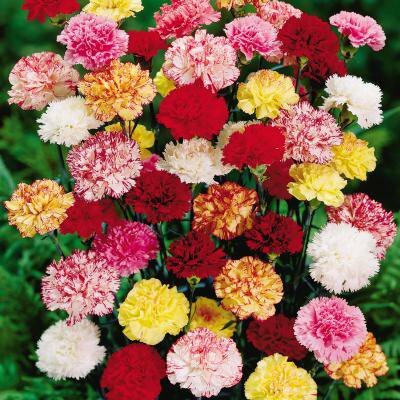 Each flower is ruffled, and so double you'll think your carnations took to skyscraper living. ''Exquisite'' is the best term to describe these Royal Horticultural Society prize winners! Have a fence, house, or garage wall that needs beautifying? Need a colorful background for your perennial bed, or a narrow, but tall divider between beds or gardens? These Double Hollyhocks are just the thing for your purpose. Give you powder-puff beauty at eye level. They stay in bloom for weeks -- from July to September. Plant 12 to 18 inches apart. Grow on a 5-7 foot stalk. We suggest you plant at least 12 for a gorgeous mass color effect. 24 plants would give you an 18 to 27 foot color wall in your garden. We send mixed colors of our choice. Attracts butterflies and hummingbirds, deer resistant, great cut flower. 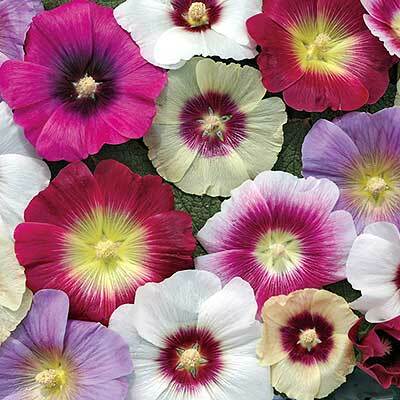 Bred for large showy single flowers that have a distinctly vivid eyezone, the Halo hollyhocks are true perennial plants that do not need to reseed like other hollyhocks. The bushy attractive plants make lots of flowers from early to mid-summer. Grow 5-6' tall and 18-24'' wide. 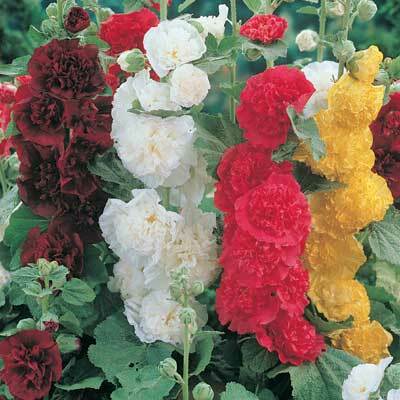 Other hollyhocks do not flower until the 2nd season and then need to reseed themselves to bloom again. 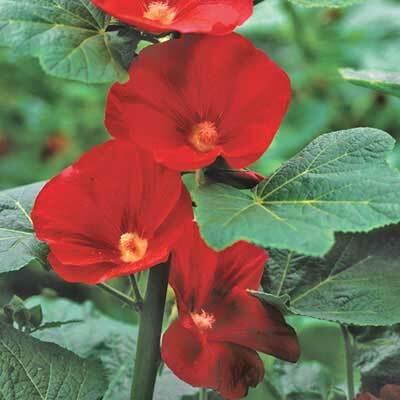 Mars Magic is a hardy perennial that comes back each year with its vibrant red flowers. Grows 5-6' tall. The most popular color of them all! 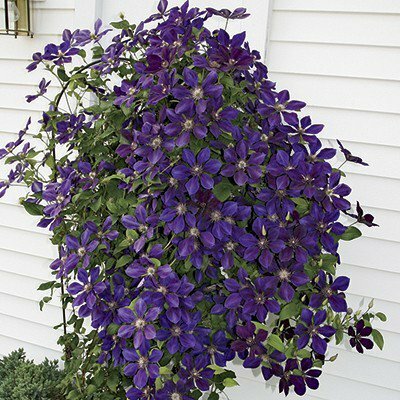 This Purple Clematis will reward you lavishly with big deep purple, 4-6'' blooms from June to September. Petals are deeply veined and have a bright golden stamen. Purple Clematis are a dazzling sight growing on a trellis or fence. Mulch base of plant if it's in a sunny area, cut back to 2' in the spring. Potted plants. For best production, plant where the vines are in the sun and the roots are in the shade. Attracts hummingbirds and butterflies. 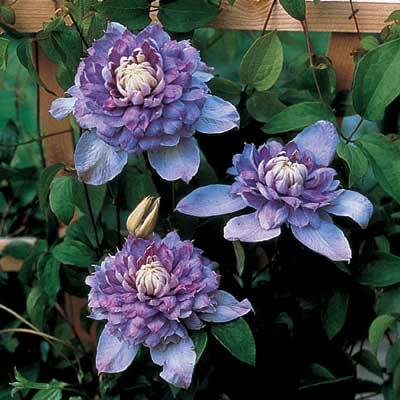 You'll marvel at the color, size and shape of our 'Blue Light' Clematis. They are exceptionally free-flowing plants that produce masses of pale blue-violet to pale-blue double flowers from late spring to early fall. 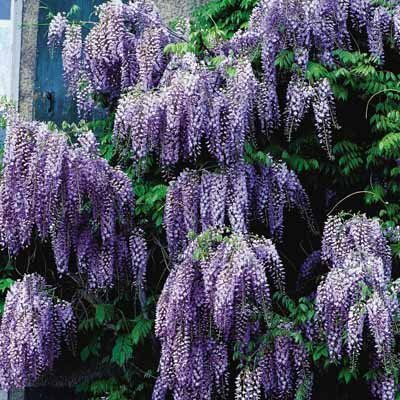 Opening 5-6'' across on 6-8' vine, the flowers are profuse and unforgettable. For best production, plant where the vines are in the sun and the roots are in the shade. Attracts hummingbirds and butterflies. Drought tolerant. Deer resistant. Have you always wanted to attract charming little hummingbirds to your yard? Plant this old-time favorite -- hummingbirds find it irresistible. The Hummingbird Vine has dark, shiny green leaves that are smothered in large, showy, orange-scarlet trumpet-shaped flowers from July to November. Hummingbirds appear to collect the sweet nectar and come back year after year. 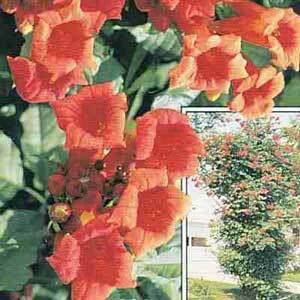 Hummingbird Vine is a vigorous grower -- reaches 20-40' tall. Covers almost any kind of support -- arbors, brick walls, fences, even covers ugly utility poles. We send hardy plants that will grow in poor soil, sun, or partial shade. Deer resistant and drought tolerant. Attracts hummingbirds and butterflies. Plant this old-time favorite -- hummingbirds find it irresistible! 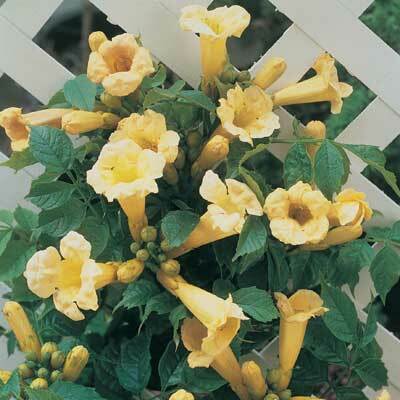 Yellow Trumpet Vines have dark, shiny green leaves that are smothered in large, showy, sunny-yellow trumpet-shaped flowers from July to November. Hummingbirds appear to collect the sweet nectar and come back year after year. The Yellow Trumpet Vine is a vigorous grower that reaches 20' or more. Covers almost any kind of support -- arbors, brick walls and fences. We send hardy plants that will grow in poor soil, sun or partial shade. Drought tolerant. Attracts butterflies. Deer resistant. Hardy, FAST growing! Hall's Honeysuckle will cover a bank or other area quickly as a ground cover - even in poor soil. Plant it at the base of a trellis and in one season you'll have a lush vine that covers the area completely. You won't believe your nose when you first smell the perfume from its buff-yellow flowers. So sweet is it, you'll have to stand back in order not to get hit by the hummingbirds that will flock to it for its sweet nectar. If you have a difficult area where grass and other plants have failed, plant Hall's Honeysuckle for a verdant carpet in a hurry. Not at all fussy about soil or adverse growing conditions. Grows in sun or shade. Cover large areas economically! Because it grows so well and so fast you can space plants as far as 3' apart. For this reason, and because of its low price, you can now afford to cover large areas where expense has not allowed before. Two-year-old transplants, each with 1-3 runners. 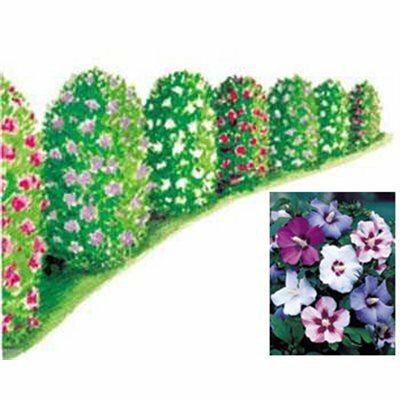 The Variegated Weigela has charming pink trumpet shaped flowers that smother these 4-6 foot plants in late spring to early summer and again in fall. The blooms continue all summer long, enhanced greatly by the distinctive green and white foliage. Attract hummingbirds to your yard. Extremely hardy plants thrive under almost any condition, have a naturally dense habit and respond well to light pruning. Variegated Weigela’s are one of nature's real bonus shrubs. 1-2' plants are sent. Plant in sun to partial sun. Fragrant, deer resistant, good for cutting. Few flowers have more decorative value in the summer garden than the Orange Glory Butterfly plant. It blooms continuously from June to August. Will start blooming this summer and have plenty of brilliant flowers for cutting as well as outdoor decoration. Grows 2' tall. Is especially effective in mass plantings -- ground covers, borders, and bed plantings. 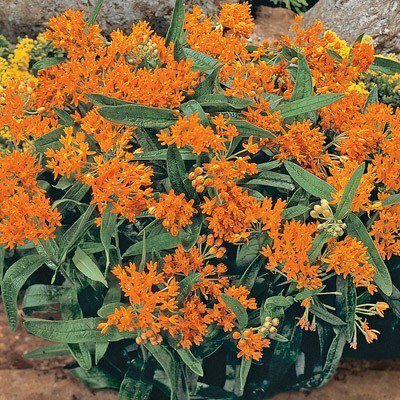 The Orange Glory Butterfly plant enjoys full sun and will withstand long periods of summer drought. Plant 2' apart. It is a strong field-grown plant. Drought resistant, attracts butterflies and hummingbirds, fragrant, for a rain garden, deer resistant and great for cut flowers. 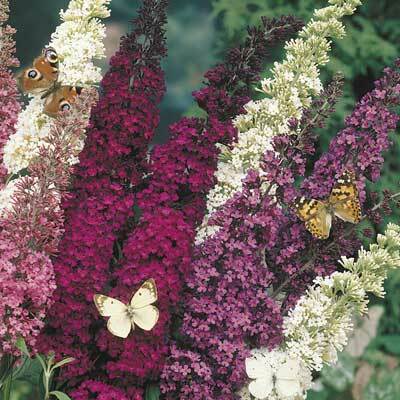 The Mixed Butterfly Bush has fragrant 8-10'' flower spikes and grows 4-8' tall. A fragrant friend of butterflies and hummingbirds. One of the most prolific sources of massed color, blooms from July to frost. This plant is a main stay of the perennial border. The long flower trusses provide a never-ending source of cut flowers. We send assorted colors: rich purples, orchid-pinks and lilacs, vibrant reds, and pure whites. 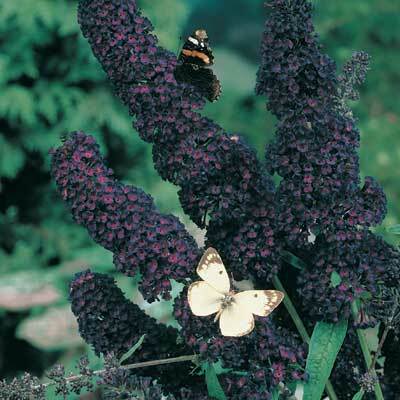 The Mixed Butterfly Bush is a strong, easy-to-grow plant. We ship sturdy ready to grow plants. In fall, after flowering, prune back to within a few inches of ground. This keeps it manageable and promotes new bloom shoots. These plants are deer and drought resistant. Plant 4-8' apart in full sun. Rapidly becoming the most popular shrub in America, Butterfly Bush is a must for every late summer perennial garden. A hallmark of this shrub is the lightly scented clusters of flowers measuring one to two feet in length. Aptly named, the butterfly bush attracts loads of butterflies and is also a favorite of hummingbirds. In northern areas of the country, they will die back to the ground in winter. 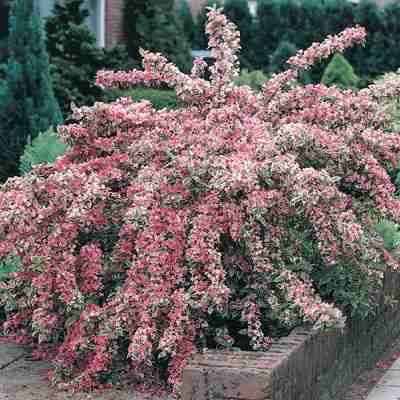 Reappearing in very late spring, you will be amazed at how quickly it once again grows into a 6-8' shrub. Outstanding when planted in full sun. Zones 5-9. The Black Butterfly Bush has wonderful dark purple-black flowers. Drought and deer resistant. Great cut flower. Butterfly Bush is a must for every late summer perennial garden. Wonderful lightly scented clusters of white, red and purple flowers can measure one to two feet in length. Aptly named, the butterfly bush attracts loads of butterflies and is also a favorite of hummingbirds. Grows 4-8' tall. Outstanding when planted in full sun. Drought and deer resistant. Great cut flower. Hardy Red Fuchsia puts on an unbelievable display of red pendant flowers that act as beacons for hummingbirds from early summer to mid-fall. Extremely ornamental plants can grow up to six feet tall. Best of all, it's completely cold hardy. 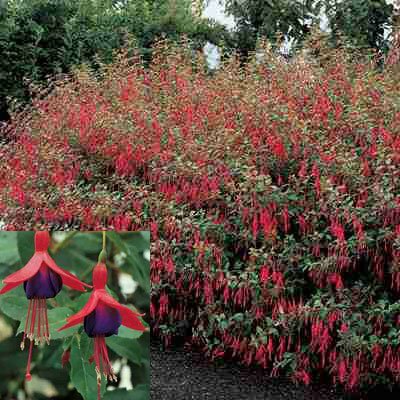 Hardy Red Fuchsia is evergreen in southern climates and deciduous in colder parts of the country. Rabbit resistant. Attracts hummingbirds. In zones 3, 4 and 5 it needs to be heavily mulched. 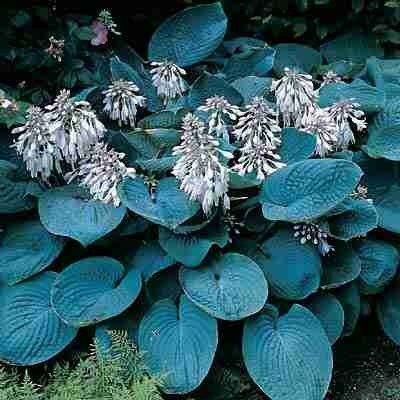 The Regal Blue Hosta brightens any dull or shady corner. A handsome, large-leafed, fast growing type Hosta. In late summer handsome pale lavender flowers appear on 30-36'' stems. Attracts hummingbirds. We send strong, hardy, field-grown plants. Hosta's are one of the best foundation plantings around! We never know which hosta our customers will order. So we never come out even! 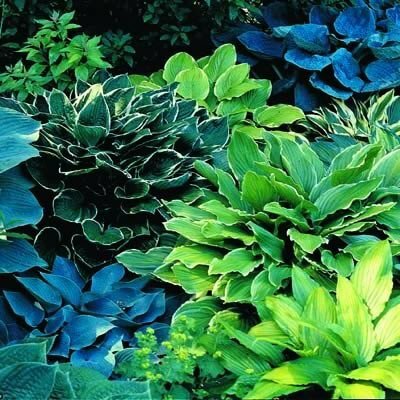 We can't tell you which varieties you will receive, but your ''handful of hosta'' may include Regal Blue, Golden Green, White Edge, White Scalloped, Green and White, Majestic Standard or another fabulous hosta. Providing regal splendor in sun or shade Hosta is rapidly becoming one of the most popular perennials. It is extremely adaptable and very resistant to diseases and insects. The beautiful foliage provides interest all season long with the handsome flowers an added bonus. Plant in any good garden soil. Will perform at its best in a rich, moist loam. We send our choice of assorted varieties. Field grown plants. Shipped bareroot, spacing of 1 1/2-3', can withstand drought conditions, attracts hummingbirds, fragrant. 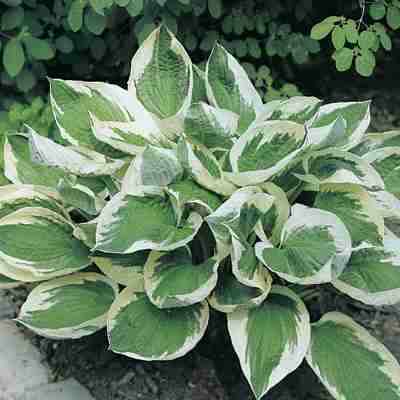 The White Edge Hosta has emerald green leaves broadly splashed with white edges. It is a hardy perennial that blooms in late summer. The White Edge Hosta grows 15-18'' high and is excellent for border planting. Strong, field-grown plants. Attracts Hummingbirds. Drought resistant. 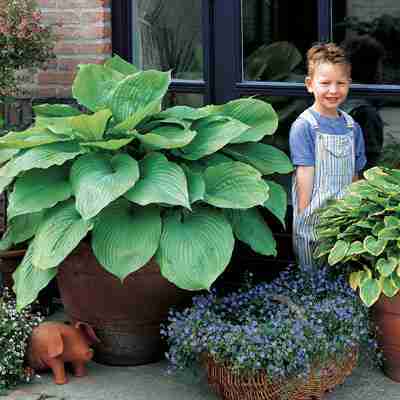 Gigantic hosta grows up to 3' tall! Humongous is the best way to describe this hosta. Huge, chartreuse-green leaves measure up to 18'' long by 14'' wide! Truly a hosta of immense proportions, Sum and Substance forms colossal clumps measuring up to 3' high by 7' wide and can get even bigger if you heavily water and fertilize. Produces lavender flowers on 60'' scapes in July-August. Good slug resistance. Drought resistant. Hummingbird attractant. Firefly's intensely colored tiny evergreen leaves that cover the stems of the plant are a brilliant combination of yellow and chartreuse in the summer. In late summer, lots of purple-pink flowers open up to make a stunning contrast with the foliage. In the fall and winter, the foliage is bright red. Grows in sunny warm areas where it will tolerate heat and drought very well. 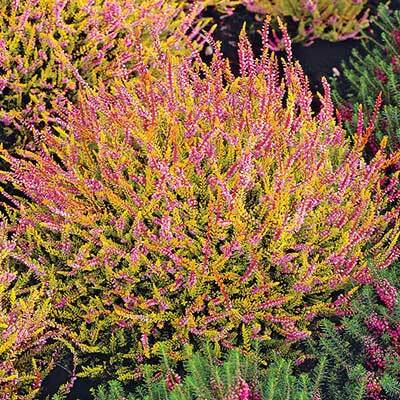 Firefly Heather has been awarded a winner of Britains prestigious Royal Horticultural Society Award of Merit. Attracts hummingbirds and butterflies. Grows 18-24'' tall and wide. Delightful red, white or purple hibiscus-shaped flowers blossom each summer in a lifetime of natural beauty. Rose of Sharon Hedge is a practical, lovely frame for your landscape. 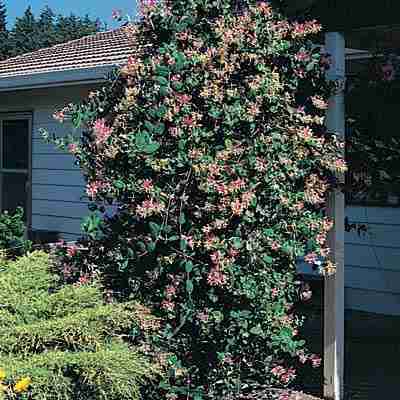 These hardy, erect-branching shrubs will grow 5-10' tall for an informal privacy screen or can be trimmed for a neat, colorful hedge. Rose of Sharon is lovely all through the growing season. In mid-summer it bursts into bloom when little else is blooming and continues to flower through fall. Attracts butterflies and hummingbirds. These hardy plants are welcome in any landscape. Order today and receive strong healthy 1-2' one year old shrubs. Plants may have single or double blooms. Mixed colors only. A cold hardy variety of a tropical favorite! 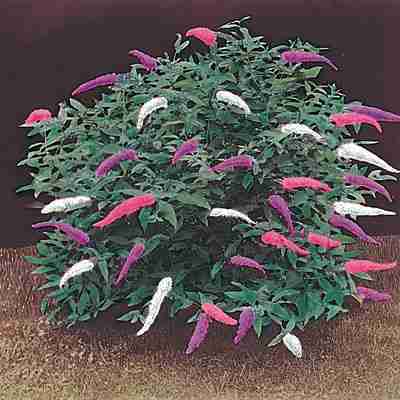 Loved for their graceful, lacy foliage and fluffy, bright pink flowers. This improved, cold hardy species can be grown in zones 5-10. The exotic flowers last May through August and attracts butterflies and hummingbirds. 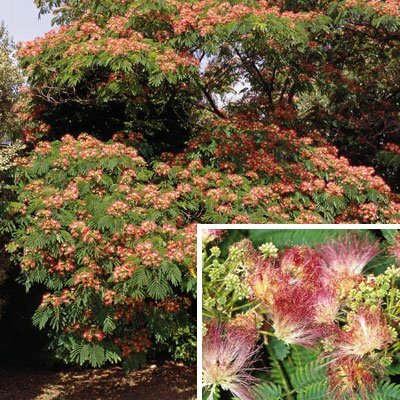 Also called Mimosa, these trees are easy to care for, drought resistant and fast growing. 20-35' high and 20-40' wide. We ship 3-4' trees. One of our favorite shrubs is now available in tree form! Beautiful pale lilac blooms have a wonderfully fragrant scent. 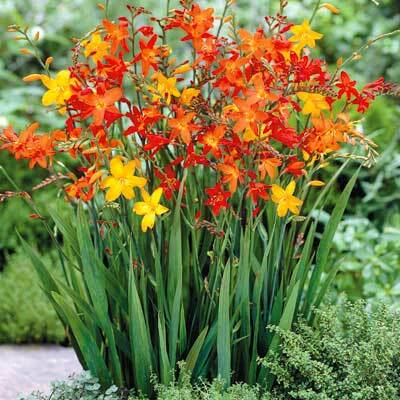 Plant one on each side of your landscape for a show-stopping effect. We invite you to shop around and compare our price - if you are lucky enough to find somebody else offering these beauties. 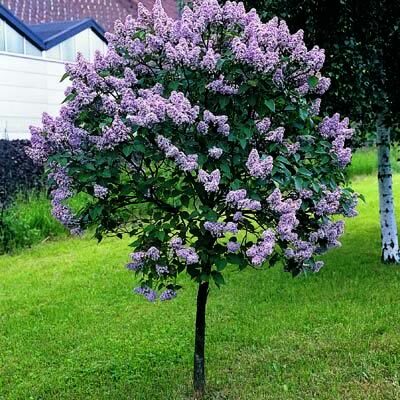 For the ultimate in beauty, as your Tree Form Persian Lilacs grow and mature, keep them trimmed to a height of 5-8'. We send 3-4' trees. Attracts butterflies and hummingbirds, good for cutting. Stay in Touch with the Latest! Subscribe to the "Hummer" Newsletter.